AirAsia’s E-Boarding Pass now available on all domestic flights! 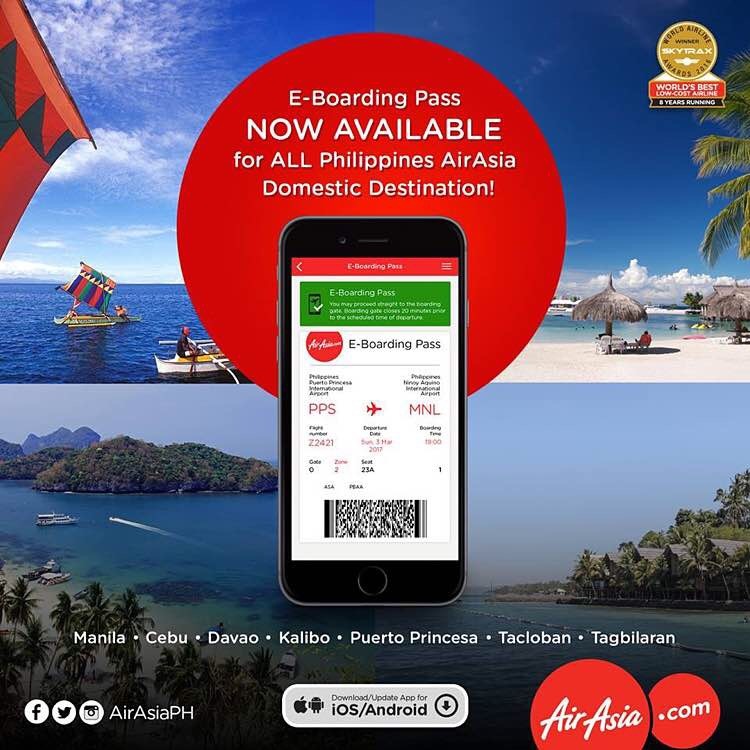 Enjoy the comfort of checking-in and boarding flights using your smartphones with AirAsia’s e-boarding pass available on all domestic flights in the Philippines. What is AirAsia’s “E-Boarding Pass”? Paperless boarding pass that allows guests without check-in-baggage to proceed straight to the boarding gate without having to queue at the check-in counter or desk at the airport. Guests with check-in-baggage, however, are required to proceed to bag drop counter first before going to the boarding gate. How to use the E-boarding Pass? Download the AirAsia Mobile App on your smartphones and use this application to check-in. Guest will receive their e-boarding pass on their mobile phone. Upon boarding, guest will use their mobile phone to show their e-boarding pass instead of the traditional paper tickets. At the boarding gate, AirAsia’s guest service personnel will verify guests’ identity and scan their e-boarding pass. Guest may then proceed to the aircraft. Guest is required to present their e-boarding pass to the cabin crew before boarding the aircraft. Find out more about AirAsia’s new products and exciting promotional fares at Facebook (facebook.com/AirAsia) and Twitter (twitter.com/AirAsiaPh). Food tripping in Bohol – A journey of delicious flavors! You are Here >> Home » Travel » AirAsia’s E-Boarding Pass now available on all domestic flights!